Another day, another dollar. Hopefully it stays that way. Several dollars more would be even better, in fact. 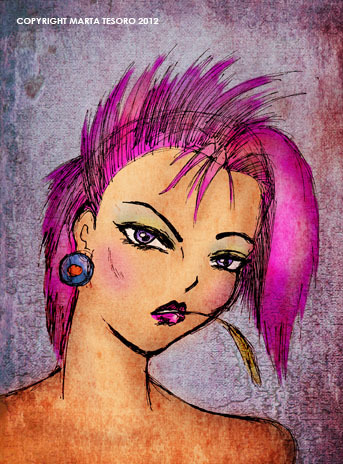 This is another quick sketch done straight with pen, no pencils and played around with in Photoshop. I do find doing post on my iffy sketches and fixing, prettying it up, both therapeutic and relaxing. So many things have happened this month that it doesn't feel like it's the start of the year anymore. Feels more like we're in the middle of 2012 instead of just the start of it. Does that make sense? Guess my month has been really jam packed and I've been focused on achieving certain goals and milestones that the year feels longer than it really is. Always more to do though. No rest for this bunny. 3D school starts in a week. I am rather excited!